We won a blue ribbon!! Wine from RootsLiving Cellars placed first in its category at the Topsfield Fair, the oldest agricultural fair in the United States. 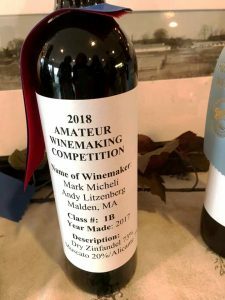 The 2017 vintage came in first place in the “Red Wine, Zinfandel” category and had the second highest overall scores in the competition in Topsfield, Massachusetts. The winners were announced in October and the blue ribbon arrived a few weeks later. We previously entered this competition in 2009 and won top honors in the same category that year. The recipe was developed following old-school doctrine passed down by my father and grandfather. I used 10 boxes of Zinfandel grapes, two boxes of Moscato grapes, and one box of Alicante grapes. My father always said to add the white Moscato grapes because they’re high in sugar and will give the wine a good kick. He said add a box of the red Alicante grapes to give the wine a good color. Bottles of the winning wines were on display at Alfalfa Winery in Topsfield where wine tasting for their wines are held. However, if you want to try some of our wines, you’ll have to come here for dinner. This year, 2018, the Topsfield Fair celebrated its 200th anniversary. The grapes came wrapped in tissue paper in plastic crates. It’s got to be fall somewhere. And so it is: in Chile. That’s why I’m able to make wine today. I purchased 10 boxes of Malbec grapes from a vineyard in Chile. I picked them up at the Beer and Wine Hobby Store in Woburn with the help of my friend, Danny, who has a pickup truck. Wine grapes are only available in the fall, after the yearly harvest. So I usually make wine in September or October with grapes from Napa Valley, California. 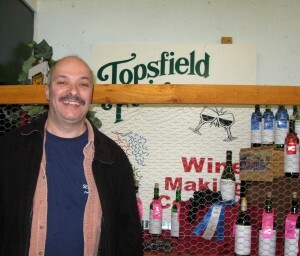 In 2009, the zinfandel I made won the top award at the Topsfield Fair. 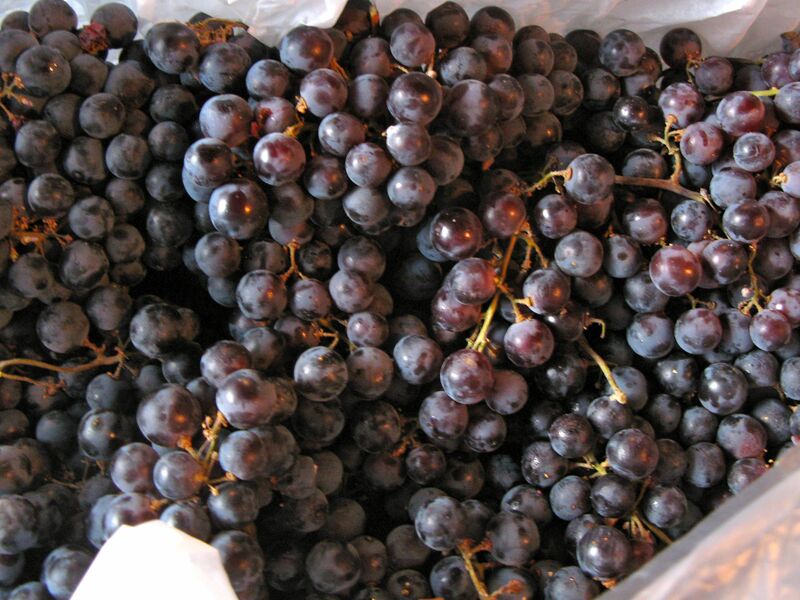 This is the first time I purchased grapes from South America. The grapes look to be in good condition, ripe and sweet, which should produce a strong wine. I hope it’s also velvety smooth with peppery notes and deep hints of black plums. The crushing begins in an hour. Wish me luck. Watching my friend Mary cook in her kitchen is more exciting than watching Rachel Ray and Giada De Laurentiis battle it out on the Iron Chef. You can see, hear and smell the food cooking, knowing that in a few minutes you’re getting some! Mary’s a great cook and hostess and last night she and her husband Ray invited a few close friends to their home in Gloucester, Mass. for sangria, tapas and paella, followed by a wine tasting. The tapas included a homemade aloili, stuffed mushrooms, manchego cheese and crackers, a mortadella and ham salad, and bowls of almonds and olives. 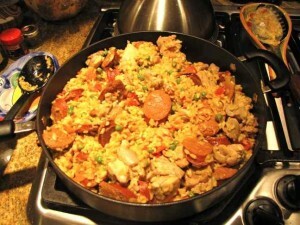 But the main course was paella, two in fact: one made with seafood and one made with chicken. Both were perfectly prepared: light, moist, a hundred flavors playing on your tongue at once with only a delicate hint of saffron. Mmm. After eating the tapas and paella we sampled a few bottles of some red Spanish wine. But to be honest, we had so much fun I can’t remember which bottle we liked best. Step 1 Heat a paella pan or very large, shallow skillet or pot, preferably with 2 handles over high heat. A large cast iron skillet would also work here. Step 2 Pour in the olive oil and let it heat up. Season the chicken all over with salt, pepper and paprika. Sear in the olive oil until brown all over. Transfer to a plate with tongs. Step 3 Lower the heat to medium and saute the onions and bell pepper until softened. Step 4 Stir in the diced tomatoes, chicken broth, and chorizo. Step 5 Bring the liquid to a boil and then stir in the rice and saffron. Step 6 Add the browned chicken pieces. The rice should be completely covered with liquid. Step 7 Cook the paella without stirring for 20 minutes. When the liquid has all been absorbed, pour the peas over the top of the pot, turn off the heat and cover the pot with a kitchen towel. Step 8 Let stand 5 minutes and then serve with lemon wedges. 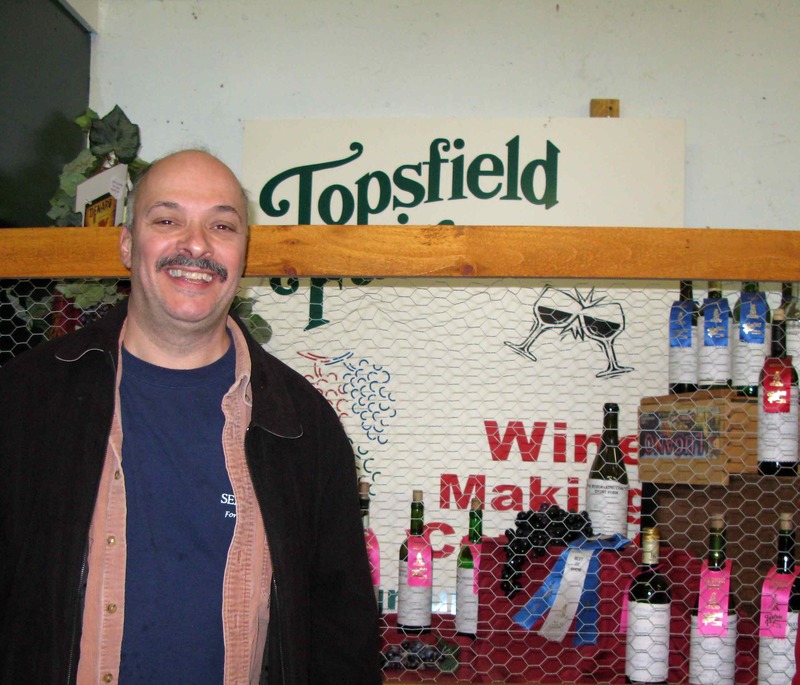 BREAKING NEWS OCT. 7, 2009: THIS JUST IN — Wine made last year in the RootsLiving wine cellar took first place in the Zinfandel category at this year’s Topsfield Fair. 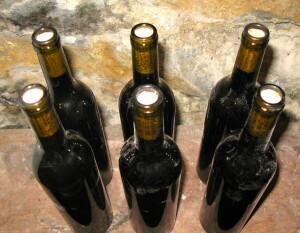 This was the first time the RootsLiving wine cellar entered one of its wines in a competition. The 2008 Zinfandel is on display at America’s oldest agricultural fair through Oct. 12. More details and photos to come. The judges must have liked the wine because many of the bottles on display were nearly empty. That was the excitement, just a few days ago, when we found out RootsLiving took top honors in the Zinfandel category at the Topsfield Fair. But what we didn’t realize until yesterday when we visited the fair was that RootsLiving also took a third place award in the “Wine Label” competition. Both the wine and label were on display at the fair in the Fruits and Vegetables Farmer’s Market building — the same room where the giant pumpkin was on display. Below are links to seven previous posts which trace the victorious journey of last year’s batch and also document the creation of this year’s batch, which was created the same way and now awaits Mother Nature’s magic in the RootsLiving Wine Cellar. Will we have another winner on our hands? 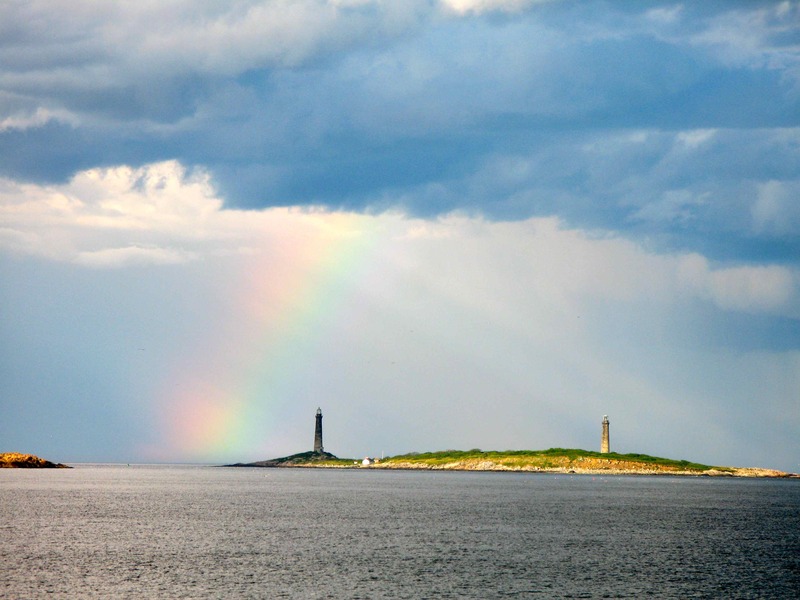 I took the photo used in this label last summer from Long Beach in Gloucester. 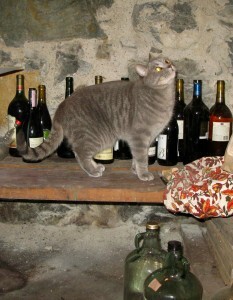 J.J. the cat investigates the RootsLiving wine cellar before the start of the season. It’s September and once again I’m calling on nature because the wine grapes have been picked and shipped across country and are ready for me to start crushing them into a purple concoction of bliss. Making wine is spiritual. You have to believe in a higher power and once you make wine, you will. Let the grapes sit overnight before you crush them. Bless the barrels in your own way. I have crosses made out of the wood from the wine crates attached to them. Let the wine sit in the carboys until St. Martin’s Day, Nov. 11. Then change them from one carboy to the next to get the wine off the lees. Bottle the wine during a waning moon (never during a waxing moon). Forget the sulfates and other preservatives and let nature do its work. I started the wine-making process today by making preparations. I plan to crush the grapes on Saturday and will document my progress here over the next few months. 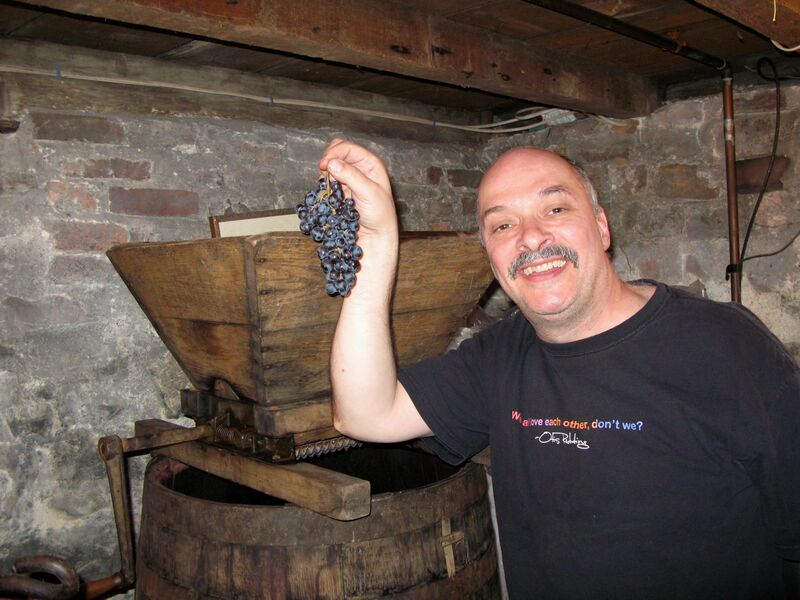 Learn more about making home-made wine without chemicals. Wine is made in the RootsLiving wine cellar without any preservatives. It’s official. 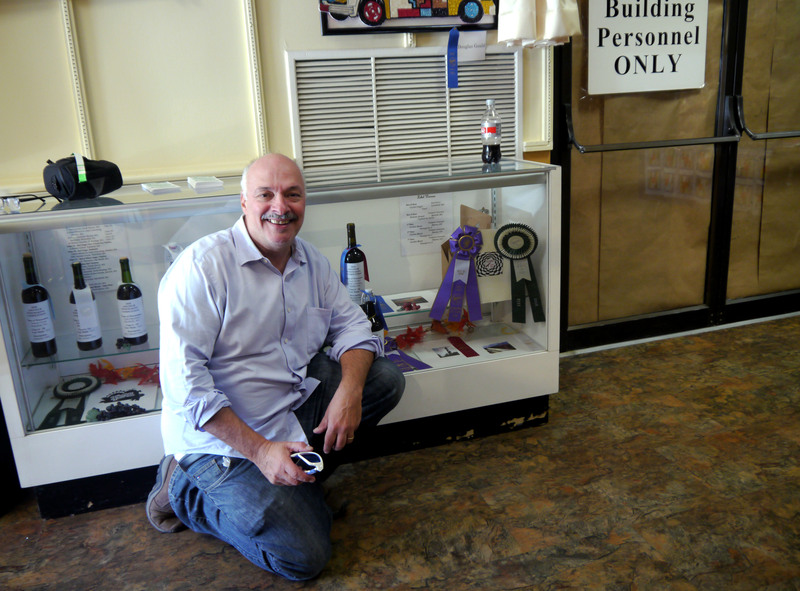 Wine from the RootsLiving wine cellar has been entered into the Topsfield Fair wine competition. The fair doesn’t start until Oct. 2 but the deadline for submitting the wine is Aug. 12. I started making wine 13 years ago with my father, following some old recipes that were passed down from his father. My favorite, and the one I submitted to the judges, is zinfandel. I get the grapes from California and zinfandel is one of the better varieties produced there. The wine grapes that they send east are probably not the best in the lot. Those, I believe, are reserved for wineries out there. So my logic tells me that if I can get the worst of the best grapes from California, then I’m doing the best I can to produce a good wine. Wine grapes are available only in the fall, so this year’s batch was made last October. The wine I make is a pure wine, free of all chemicals, which means no sulfates or preservatives of any kind. The 2008 vintage is a good one: a strong, mellow flavor of red fruits, featuring a dark red color with light raspberry-colored highlights, followed by good strong legs (the streaks that form on the wine glass when the wine is swirled). 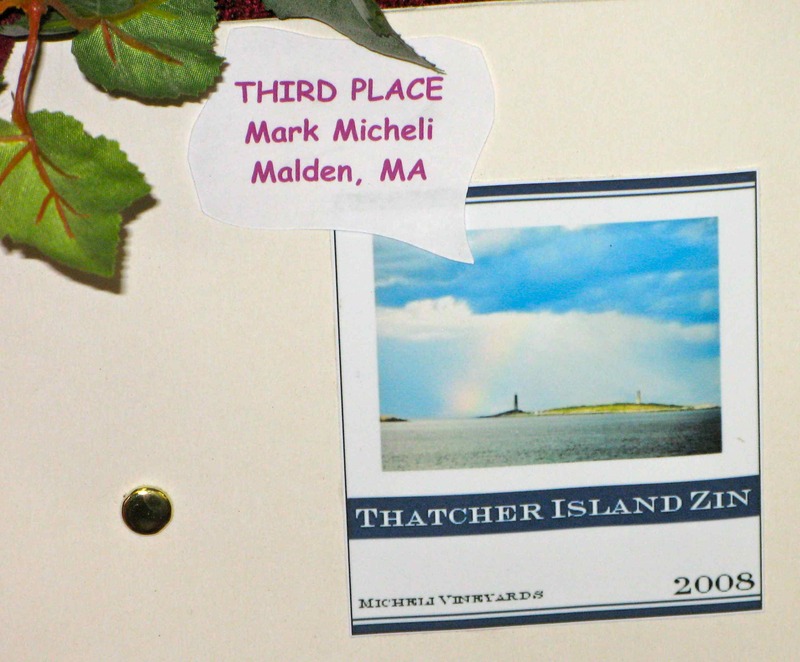 I also entered the wine label contest at the Topsfield Fair by making a label using this photograph. 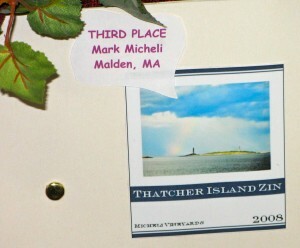 Wine, under this label, is appropriately called, "Thatcher Island Zin." This is the first time I entered my wine in any competition. I’d rather drink than compete. You know, make love, not war. But over the years friends and family have praised the wine and I thought it would be good to get the opinion of some impartial judges. (After all, I end up giving a lot of my wine away to friends and family. What else are they going to say?). Last winter I had the pleasure of meeting another contestant, John Misuraca, and his wife, Sandra. 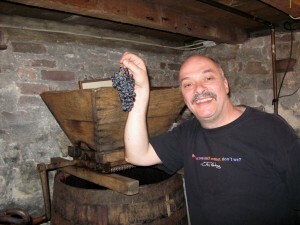 His family has been making wine at his home in Gloucester the old fashioned way: by crushing it with their feet. 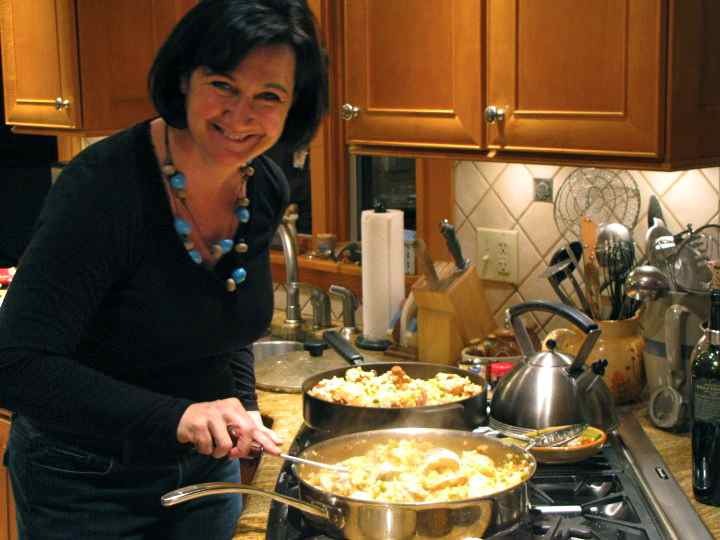 We met over an unbelievably fabulous dinner (one worthy of being mentioned in any high-end food magazine, such as Gourmet or here on the virtual pages of RootsLiving) at Mary and Ray Hilshey’s house in Gloucester. We both brought bottles of our homemade wine to sample. John’s red was great and took second place the last two years at the fair, so I know the competition is going to be tough. Learn more about wine at MakingVino.com.